This morning we both got up at the same time. Did not take long before the FW started to warm up. Today's high is supposed to be 87 at least. We had coffee and I started to prepare breakfast. First we had a smoothie, then I made Jim some eggs, he made his toast. I made oatmeal with quinoa. As Jim got ready outside the neighbor was talking to him, and slowed us down a little. I premade wraps for lunch and we left at 9:45. We had a lovely drive today, hardly any traffic, smooth roads, Blue Skies and sunshine. It felt like we were doing out of the way Backroads, sort of. Even though they were 4-lane highways, with just very little traffic. So no rest areas around, we finally found a pilot fuel station, for our first and only stop. We filled up while we were here and grab lunch quick. We drove about 229 miles today. 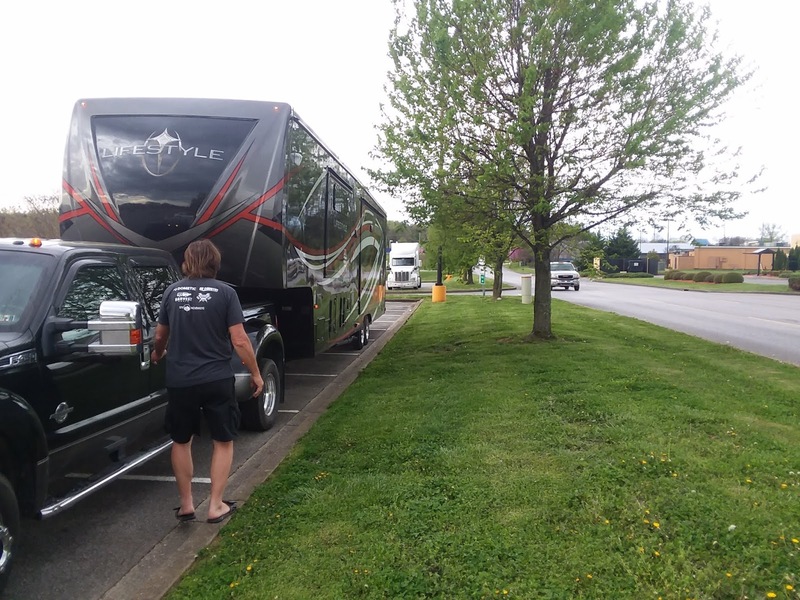 From Diamond Caverns RV Resort & Golf, TT in Park City Kentucky, to a Walmart in Morristown, Tennessee. We had a time change again, now we're back on Eastern time. We arrived here around 3 p.m. Parked and went into Walmart to make sure it was okay to stay the night. They want us to go to the back of the parking lot which is our favorite spot anyway. There's just a service road right behind our grassy spot, that I call our backyard. But it's a nice spot. After we got situated we put the fans on, it was warm in here, it said it was 80, but it didn't feel that hot. I got ready and went inside to shop, the fridge is pretty bear, which makes things slide around too much in there when we move. I came out put everything away heated up some pre-made food for dinner made a salad. Jim got the generator going, watched a little TV, took a shower went to bed.